Set along the Atlantic oceanfront, this shingle-styled custom home is a "flipped" plan where the main living and entertaining occurs on the second floor. The client chose this layout to view the breakers on the ocean beyond the lagoon and on-site golf course. A perfect blend of wood, stone, glass and metal create a contemporary southwest styling for this one-of-a-kind custom built home. The pentagon shaped beams made of treated sheet metal, line and define the ceiling while walls of glass rim the back of the house, drawing your eye to the spacious backyard. The exterior of this home offers many outdoor elements for entertaining at a grand scale with its open patios and seating areas, a full size lap pool and access to golfing. Use of natural materials and landscaping create a private feel surrounding the home site. Category: Best One-of-a-Kind Custom Home (Built for a Client) 4,001 to 6,500 sq. ft.
Designer/Architect: Conk Architecture, Phoenix, Ariz. Builder: Manship Builders, Inc., Carefree, Ariz. Interior Designer: EST EST, Scottsdale, Ariz. Incorporating a century old square-log building as the design crux, this spec ranch meets modern times with its upgrade to a home theater system and automated lighting among other modern amenities. Still, the space retains the unique character of hand-crafted timber homes of old. Most of the exterior siding came from existing buildings on the property. Locati Architects P.L.L.P. spent a great deal of time evaluating the site and where to properly place existing structures to blend with the new. Category: Best One-of-a-Kind Spec-Built Home up to and including 4,000 sq. ft.
Designer/Architect: Locati Architects P.L.L.P., Bozeman, Mont. Builder: Schlauch Bottcher Construction, Bozeman, Mont. Interior Designer: Locati Architects P.L.L.P., Bozeman, Mont. Land Planner: Locati Architects P.L.L.P., Bozeman, Mont. The Black Hammock has the simplicity and pureness of a farmhouse with a contemporary and industrial feel - and a budget that's easy on the pocketbook. The design strategy was to create a home that uses off-the-shelf items — industrial stairs, floor grates, exposed concrete block, cables and pipes — in unusual ways that manage to convey warmth and a sense of home. It is possible to build a custom home without being embarrassed by the cost of construction. The builder used Home Depot and Lowe's extensively for the cabinetry, solid core doors, hardware, lights, fans and countertops. Category: Best One-of-a-Kind Custom Home (Built for a Client) up to & including 4,000 sq. ft.
Designer/Architect: Bloodgood Sharp Buster Architects and Planners, Inc., Oviedo, Fla. Builder: Chess Incorporated, Oveido, Fla. Interior Designer: Bloodgood Sharp Buster Architects and Planners, Inc., Oviedo, Fla.
Land Planner: Bloodgood Sharp Buster Architects and Planners, Inc., Oviedo, Fla.
Organic craftsman and desert southwest. The two merge to create a unique and innovative architectural feel that makes this home a treasure in both styles. Craftsmen stained the tumbled brick floors to meet the aged patina of a century-old floor. Hand-hewn beams link with intricacy and the coffered beam ceiling blends with hand-applied Venetian plaster to elicit an old-world charm. The plaster on interior walls gives the appearance of old adobe. The master suite has a custom sandblasted glass screen that takes a page from Frank Lloyd Wright. Designer/Architect: JP Malone Construction Inc., Scottsdale, Ariz. Builder: JP Malone Construction Inc., Scottsdale, Ariz. Interior Designer: Jan Anderson, Carefree, Ariz.
Land Planner: Pinnacle Engineering, Scottsdale, Ariz. Built within a well-established neighborhood dating back to the Depression, this custom-built home was designed for a client with the need to entertain casually. Commonly used materials like stone and cedar shake siding help the home blend in. The interior layout of the house is divided into three zones — an informal zone off of the garage, a formal zone in the middle, and a private master suite area on the right. The plan opens to a formal entry, which deemphasizes the stairs to the right. A large window wall in the living room overlooks the water on the property. Category: Best One-of-a-Kind Custom Home (Built for a Client) up to & including 4,001 to 6,500 sq. ft.
Designer/Architect: Bill Andrews Architects, Knoxville, Tenn. Builder: Schmid & Rhodes Construction, Inc., Knoxville, Tenn. Interior Designer: Housebones, Knoxville, Tenn.
Land Planner: Benpage Associates Landscape Architects, Nashville, Tenn. The Ranch House is an unabashed homage to Wallace Neff, an acknowledged masters of the Mission Style, who turned the vernacular of the Mexican rancheros into something elegant and timeless. It evokes the Southern California of the 1920's when homeowners believed in the fantasy of being gentleman farmers living on a hacienda. "With its symmetry, quiet palette, simple roof lines and soft natural light, the Ranch House has an air of serenity," says architect Robert Hidey of Robert Hidey Architects. "Hand-worked stucco walls, deep loggias, hammered ironwork and adobe brick are authentic details that harken back to the glorious ranchero days when artistry and craftsmanship were everything." Category: Best One-of-a-Kind Spec-Built Home 4,001 sq. ft. to 6,500 sq. ft.
Designer/Architect: Robert Hidey Architects, Irvine, Calif. Builder: Monarch Estates, Irvine, Calif. Interior Designer: Ebanista, Laguna Niguel, Calif. Developer: Monarch Estates, Irvine, Calif.
Land Planner: Robert Hidey Architects, Irvine, Calif.
Wall Street broker Jeffrey Jones escaped Tower One of the World Trade Center on 9/11. When he built his vacation home, he understandably wanted to create a safe haven for his family. The home also is designed to welcome guests and for entertaining. An open floor plan accommodates large groups. Antique timber columns with trusses or beams defines room functions without encroaching on the spacious feel. Features include a lush green lawn edged in wildflowers, lake and mountain views, massive natural stone fireplaces, three guest suites for adult couples, a boys room that sleeps eight in four bunk beds, and a girls room that holds a queen-sized bed with four berths built in. Designer/Architect: TKP Architects, Golden, Colo. Builder: Denman Construction, Whitefish, Mont. Interior Designer: McNamara Design, Denver, Colo.
Land Planner: TKP Architects, Golden, Colo. The architects achieved a close-to-the-earth feel with this spec-designed custom home for the luxury move-up market by blending the architecture and landscaping with the surroundings. Each interior and exterior space is both destination and gateway, with 360-degree circulation encompassing front and rear loggias, a central courtyard and naturally lit, arched hallways. Like the Tuscan farmhouse, single-story wings are clad in actual stone and repeated in low entry walls, the courtyard fireplace and backyard planter. Tuscany-imported terra cotta bricks accent the rich stonework, as do Tuscan-style columns, substantial eave and chimney detailing, shaped rafter tails, and the front loggia's ridged beam, which is hewn from a single tree. Designer/Architect: Bassenian/Lagoni Architects, Newport Beach, Calif. 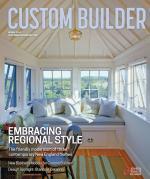 Builder: Warmington Custom Homes, Costa Mesa, Calif. Interior Designer: Pollock & Associates, Costa Mesa, Calif. Built in the Sonoma Valley Mission style, this house achieves an Old World feel with smooth finish stucco and clay tile roofing, exposed wood beams and rafters, flagstone walkways and architectural concrete cladding and trim. Wire brushed cedar windows and doors coupled with round copper gutters complete the authentic look. The Old World feel is apparent in the interior as well with the scraped-wood floors, tumbled-stone inserts, marble baths and hand-forged iron stairways. Designed to be grand yet inviting, the rooms are well proportioned with furniture and rich fabrics to offer an atmosphere of comfort and relaxation. Designer/Architect: The Design Collaborative, Eldorado, Calif. Builder: Travos Homes, Inc., Rocklin, Calif. Interior Designer: Taylor Roberts Model Home Furnishings, Philo, Calif. Taking the small lot into consideration, Urban Design Associates, Ltd. designed a second home for this client with the ability to entertain guests, but keep the public space separate from their own space. A wing with four bedrooms and a living room provide a private area for family. The slight slope allowed Urban Design Associates to create a walk-out lower level, making a perfect place for a casual living area with a game room, theater, wine cellar and exercise room. Designer/Architect: Urban Design Associates, Ltd., Scottsdale, Ariz. Builder: Peterson Varley, Inc., Scottsdale, Ariz. Interior Designer: Billi Springer and Associates, Scottsdale, Ariz. This custom spec home overlooks Little Assawoman Bay on Fenwick Island, Del., but is also just a few blocks from the ocean. Senior associate, Christopher Pattey, of Becker Morgan Group took advantage of this extremely narrow lot to accommodate a beach house with the maximum number of bedrooms and baths possible, while providing an open floor plan for entertaining. The home has a first floor master suite, allowing for a single level lifestyle with an upstairs containing four additional bedrooms with private bath access. The home also incorporates porches, decks and balconies accessible from almost every room through French doors, which enhances the indoor/outdoor summer beach lifestyle. Category: Best One-of-a-Kind Spec-Built Home up to 4,000 sq. ft.
Designer/Architect: Becker Morgan Group, Inc., Salisbury, Md. Builder: Joseph T. Dashiell, Inc., Ocean City, Md. Developer: Joseph T. Dashiell, Inc., Ocean City, Md. Built with antique wood reclaimed from a 150-year old gold mine, this spec home was built to show how TKP Architects PC could create a Montana lodge offering a warm yet rugged feel. It was conceived as a rustic, richly detailed structure nestled in its wooded surroundings yet maintaining access to spectacular views. "Native stone adds to the indigenous, handcrafted feeling of the exterior, and over-scaled timber details recall Montana's heritage and construction techniques of yore," Karen Keating, president of TKP Architects, says. The large Great Room becomes the heart of the home with its huge three-sided stone fireplace, providing the Great Room, Dining Room and Hearth Room with warmth. Category: Best One-of-a-Kind Spec-Built Home 4,001 to 6,500 sq. ft. Interior Designer: Carol Nelson Design, Kalispell, Mont. Developer: Douglas Gamble Development, Whitefish, Mont. Riffe Homes, Inc. built this home to create interest and set a standard by promoting a more expensive product line for its latest community in Kansas City, Mo. "It gives a feeling for the unique character we're creating," president, Jim Riffe, of Riffe Homes says. "It wasn't a typical Kansas City home." This home was also used for new building ideas Riffe wanted to dabble with, such as shifting paradigms of the typical design and creating more subtle definitions between spaces. This is accomplished by the multifunctional space defined by a canopy of tongue and groove cedar above, and a thin veil of glass to the front and rear that occupies the center of the home. Designer/Architect: R.S. Bickford & Co., Overland Park, Kan. Builder: Riffe Homes, Inc., Lake Winnebago, Mo. Interior Designer: Hobson's Interiors, Kansas City, Mo. Developer: G & R Development, Lake Winnebago, Mo. Land Planner: Archer Engineering, Lee's Summit, Mo. Designed for the new golf resort community, The Peninsula on the Indian River Bay, this homes is one of a series of custom homes. The developer desired unique custom architecture to interest discriminating high-end buyers, setting it apart from ordinary homes found along the Delaware beachfront. On the front façade, the columned, louvered tower balcony is buttressed by a sweeping curved element to become the focal point. Exciting colors of the Caribbean creates a unique blend of design for the exterior with the East Coast shingle vernacular and textures. Builder: Echelon Custom Homes, Rehoboth Beach, Del. Interior Designer: Echelon Custom Homes, Rehdooth Beach, Del. Developer: Odyssey Development, Inc., McLean, Va.
Land Planner: McCrone, Inc., Salisbury, Md. Comments on: "Best in American Living Awards"